Osteoporosis is a medical condition in which the bones become brittle and fragile from loss of tissue, typically as a result of hormonal changes, or deficiency of calcium or vitamin D. Osteoporosis develops gradually, usually without symptoms. A broken bone that occurs with minor trauma, such as a slight blow to the wrist, for example, is typically the first symptom. Approximately one in two women and one in four men over age 50 will have an osteoporosis-related fracture in their remaining lifetime. 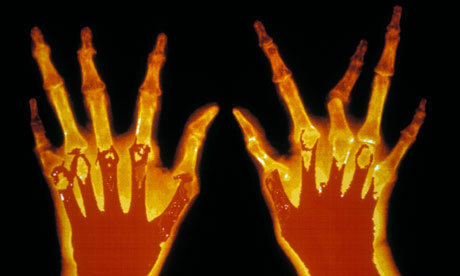 If you are age 65 or older, you should get a bone density test to screen for osteoporosis. If you are younger than 65 and have risk factors for osteoporosis, ask your doctor or nurse if you need a bone density test before age 65. Bone density testing is recommended for older women whose risk of breaking a bone is the same or greater than that of a 65‑year‑old white woman with no risk factors other than age. A bone mineral density (BMD) test measures the strength of your bones to help assess your future risk of fractures. This test is not usually performed until after menopause unless you have an unusual clinical situation or are at high risk for osteoporosis. It is quick, painless and noninvasive. The best way to prevent weak bones is to work on building strong ones. No matter how old you are, it is never too late to start. Building strong bones during childhood and the teen years is one of the best ways to keep from getting osteoporosis later. As you get older, your bones don’t make new bone fast enough to keep up with the bone loss. And after menopause, bone loss happens more quickly. Increase the amount of calcium and vitamin D in your diet. Exercise regularly; bones and muscles respond to physical activity by becoming stronger. Weight-bearing exercises like walking and weight lifting are the most beneficial. Maintain a healthy body weight. Being underweight or losing weight increases your risk of bone loss and fracture, and ultimately, of developing osteoporosis. Quit smoking. Cigarette smoking (nicotine) can reduce bone mass and increase the risk of fracture, thus increasing your risk for osteoporosis. Ask your health care professional to recommend methods to help you quit. Drink alcohol in moderation, if you drink. Excessive consumption of alcohol increases your risk of osteoporosis and fractures from falls. For some women, medication may also be helpful for preventing additional bone loss. Ask your health care professional what the best osteoporosis prevention strategy is for you. The importance of beginning bone loss prevention at a very young age is now well understood. Bone health programs are being developed and implemented that targets girls as young as nine to 12 years of age and their parents, focusing on promoting good nutritional choices and participating in regular physical activity. Contact us if you have any questions or to schedule an appointment. Summer is finally here! 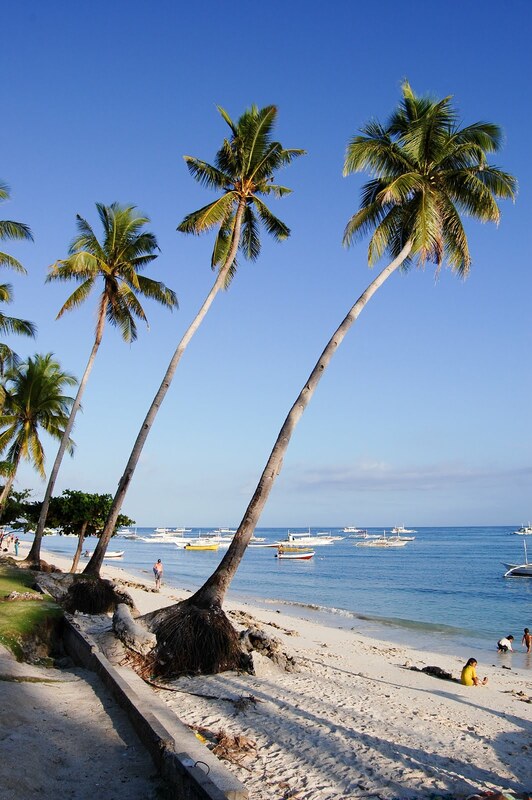 As you plan your exotic vacation, the excitement of what lies ahead begins to really grow. But, have you asked yourself the question, “what if, among the once-in-a-lifetime paradise I am visiting, I do something to leave me stuck inside my hotel room sick?” Let us offer you some tips to keep you in tip-top shape while you’re in paradise. You should get vaccinated against any diseases that may be endemic to the region where you’re headed at least four weeks before a trip out of the country. Visit the Centers for Disease Control and Prevention site to learn more about diseases you may come in contact with during your trip. Don’t drink tap water or use it to brush your teeth. Use filtered or bottled water instead. Ice in your drinks could spell disaster, so avoid it altogether. Bottled drinks with a seal are usually safe, and so are boiled water and hot drinks made with boiled water. If food has been kept at room temperature in warm locations, it could have been exposed to flies. Try only eating food that is served hot. Don’t eat salads, uncooked fruits and vegetables unless you’ve washed and peeled them yourself. If you are visiting an area where mosquitos are common, sleep under a mosquito net to avoid being bitten at night. Extra tip: Carry a small sewing kit with you to repair any holes. Malaria mosquitoes bite between dusk and dawn, so being indoors during these hours can reduce the number of bites. Using products with DEET are the most effective insect repellents, but be sure to read the directions for their proper use. Avoid tight clothing, which mosquitos can bite through. Wear loose-fitting clothing in malaria hotspots. Jet Lag can throw your biological clock with weakens your immune system. Try adjusting to your new schedule at least a week before you travel, if possible. Go to sleep and wake up earlier/later depending on which direction you’re heading. Don’t try to cure jetlag with caffeine or alcohol. This will give you an inefficient amount of sleep and possibly make conditions worse. Follow these tips, and plan for your safety on upcoming trips. Proper planning will allow you to make the most of your vacation and come back with great stories to tell your friends and family. We want to give honor to our nursing staff. They work hard everyday and we’re so grateful for their effort! Nurses: Advocating, Leading, Caring Often described as an art and a science, nursing is a profession that embraces dedicated people with varied interests, strengths and passions because of the many opportunities the profession offers. As nurses, we work in emergency rooms, school based clinics, and homeless shelters, to name a few. We have many roles – from staff nurse to educator to nurse practitioner and nurse researcher – and serve all of them with passion for the profession and with a strong commitment to patient safety. National Nurses Week is celebrated annually from May 6, also known as National Nurses Day, through May 12, the birthday of Florence Nightingale, the founder of modern nursing. Visit the NNW History page, part of theNNW Media Kit. See below to learn more. The National Nurses Week logo is developed by the American Nurses Association (ANA) to help celebrate nurses and all that they do. ANA does trademark this logo but allows facilities to use it in their own celebrations. Guidelines for logo use and downloadable files are available in the NNW 2012 Logo Library. We love our Amarillo Diagnostic Nursing Staff! This week we have put you in the eyes of a patient taking a sleep study to show you what the experience is like. Welcome to the ADC Sleep Center. You have been scheduled for a sleep study. You will be scheduled to begin between 8-9:30PM. Feel free to bring your normal toiletries and sleep wear. You may also bring your own pillow. Your sleep experience will start with paperwork which allows you to tell us how you’ve spent your day. To determine if a sleep disorder exists, your physician will need to know what body function changes occur during your night of sleep. They do this by attaching several monitoring sensors to your body.This process takes approx. 30 minutes and allows you time to ask any questions that you may have. Our first goal will be to determine when you go to sleep and what stages of sleep you reach. We do this by recording your brainwave patterns as well as your eye movements. We monitor your heart rate to see if you have any irregular heart beats during your sleep. A sensor on your finger will monitor if your body is receiving the amount of oxygen it needs. 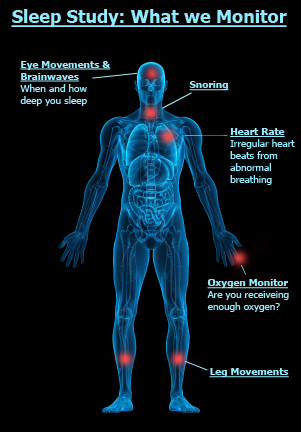 One of the most common reasons a sleep study happens is because of snoring. To measure, we will apply a small microphone to your neck. Often people will have leg movements at night, which can disrupt your sleep. We will put sensors on your shins to measure this. We’ll monitor your air flow to see if you stop breathing during the night. If the technician notices abnormal breathing patterns, they may awaken you early in the study to apply a breathing mask for the night which will ensure normal breathing patterns. An intercom in the room will allow for communication in case you have any questions or need to go to the bathroom during the night. Technicians will be available throughout your study but will not disturb you unless absolutely necessary. Your study will conclude at around 6am the next morning. Congratulations, you have completed your sleep study, and we will schedule a meeting to review your results. Check out the video below to see what you will learn from your sleep study. 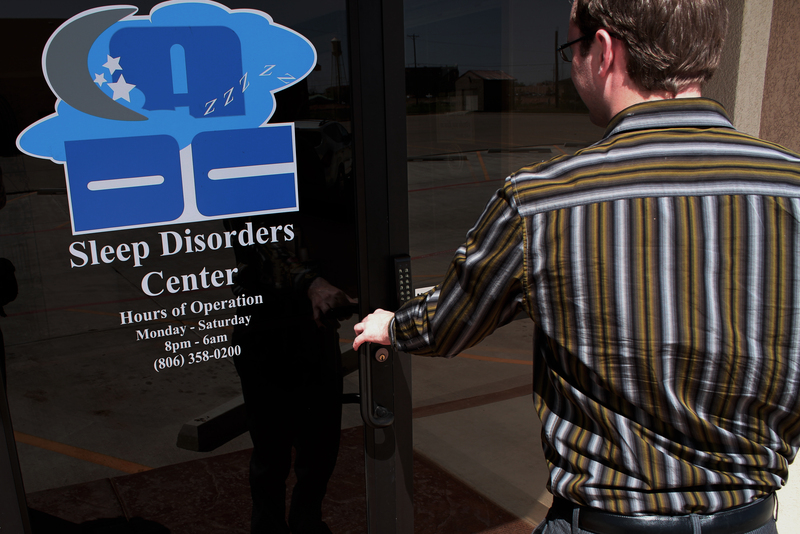 Call us at 806.356.5522 or check out or website to learn more about our Sleep Center. Diabetes is a lifelong (chronic) disease in which there are high levels of sugar in the blood. The latest statistics released in 2011 show that 25.8 million children and adults in the United States—8.3% of the population—have diabetes. Yearly, diabetes contributes to over 200,000 deaths. These statistics are daunting, but diabetes can be kept under control. At the Amarillo Diagnostic Clinic, we know that by being active, eating healthy, and keeping your blood glucose, blood pressure, and cholesterol under control, you can prevent diabetes problems. There are many publications and information out there regarding diabetes, but the general public can be confused on certain aspects of diabetes, specifically the largest culprit of diabetes problems, sugar. 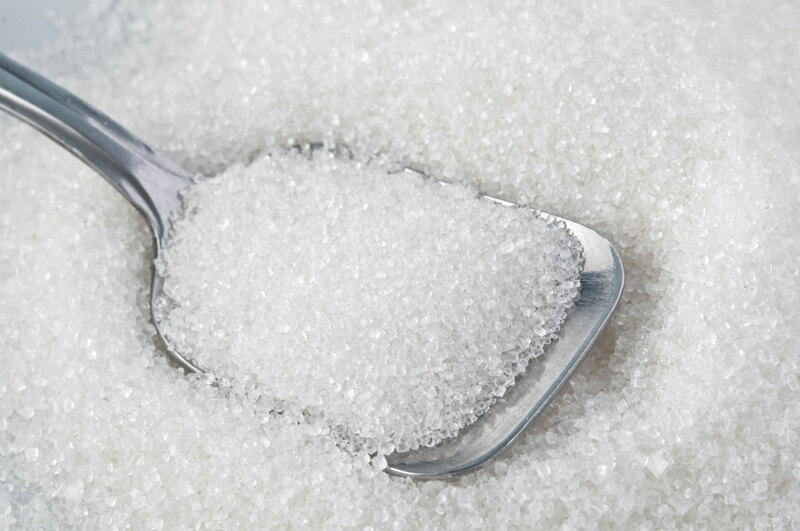 Let’s pull back the curtain on the sugar myths and exaggerations and learn what you or someone you know suffering from diabetes can do to keep glucose levels in check. Too much sugar does. Diabetes means your body can’t clear glucose from your blood. And when glucose isn’t processed quickly enough, it destroys tissue, Levitsky says. People with type 1 diabetes were born that way—sugar didn’t cause their diabetes. But weight gain in children and adults can cause metabolic syndrome, which leads to type 2 diabetes. What matters: That “normal” pancreas. Overeating forces your pancreas to work overtime cranking out insulin to clear glucose. Eric Westman, M.D., an obesity researcher at the Duke University medical center, says that in today’s world, “it’s certainly possible that the unprecedented increase in sugar and starch consumption leads to pancreatic burnout.” But researchers can’t be sure; everyone’s body and diet are different, so generalization is iffy. One thing that is sure, Dr. Westman says, is that the rise in sugar consumption over the past 100 years is unprecedented. Your job: Drop the pounds if you’re overweight, and watch your sugar intake. Research has shown for years that dropping 5 percent to 7 percent of your body weight can reduce your odds of developing diabetes. In the 1970s and 1980s, the average American’s body weight increased in tandem with the food industry’s use of high-fructose corn syrup (HFCS), a staple because it’s cheap. But it’s not a smoking gun. “This is a correlation, not a causation,” says Levitsky. Dr. Westman notes that the effect of a high-glycemic food can be lessened by adding fat and protein. Spreading peanut butter (protein and fat) on a bagel (starch, which becomes glucose in your body), for example, slows your body’s absorption of the sugar. 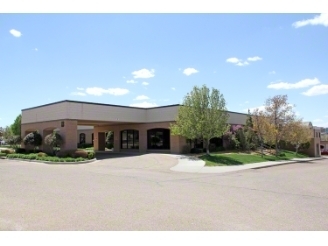 Amarillo Diagnostic Clinic treats a variety of adult illnesses ranging from acute colds and flu to more serious conditions such as hypertension, diabetes and cardiac diseases. 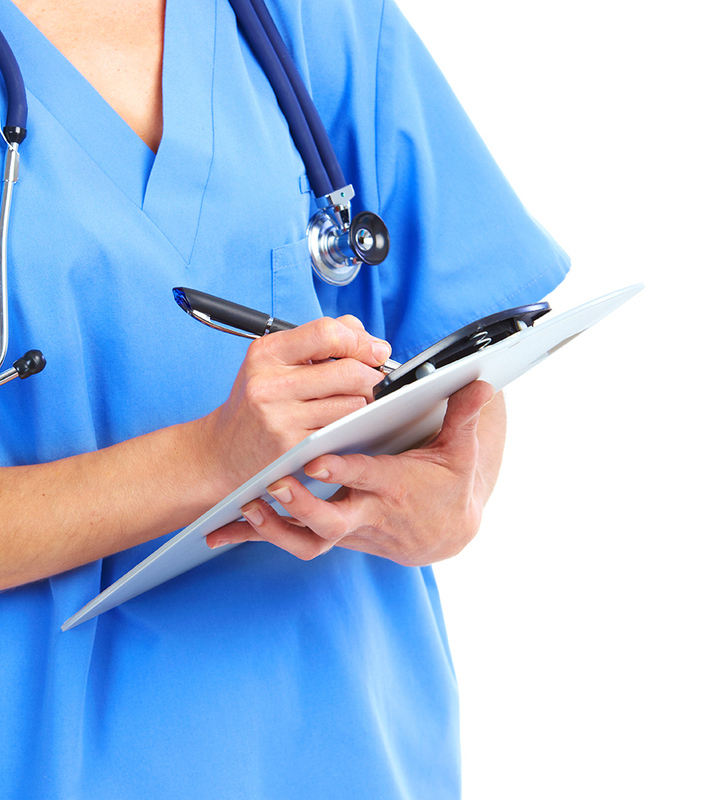 Click here to see a list of medical specialties that Amarillo Diagnostic Clinic offers.